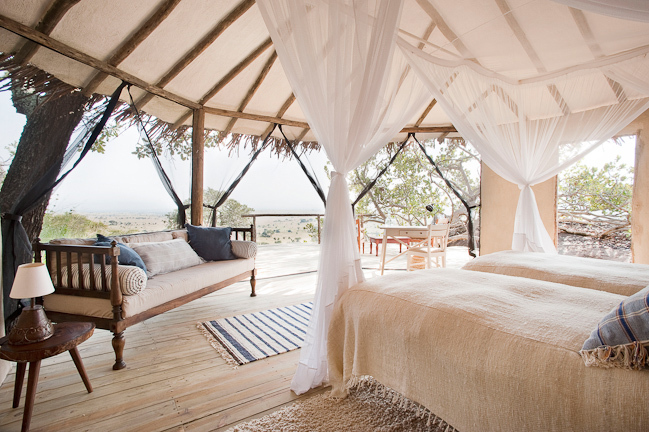 Lamai Serengeti now sits tucked amongst the rocks of Kogakuria Kopje with panoramic views of the surrounding landscape, just a few miles from where the wildebeest cross the Mara River. For roughly a quarter of the year, between late July and October, this is where you'll find the migration. Right here, on our doorstep. This involved much sitting in quiet and careful contemplation, with binoculars, compass and sundowner in hand. But also, and perhaps of even greater importance, each site is designed such that to the casual eye you won't see that there is anything there. The brief was simple: to become the guardian of this kopje, we needed to preserve all the things about it that has made it iconic. The rooms - a clever blend of canvas, plaster and natural poles - have given our 'camp designers' much debate, thought, and - to be honest - a multitude of headaches. The brief was simple: to become the guardian of this kopje, we needed to preserve all the things about it that has made it iconic. We've designed each of the rooms to fit into the complex geometry of the kopje and to make the most of this sensational location, its views and its natural space and light. At Lamai Serengeti we have just 12 rooms in all. These are split between two entirely separate lodges, the Main Lodge of 8 rooms and our smaller Private Lodge of 4 rooms. 12 open-fronted rooms, split between two separate lodges: the Main Lodge of 8 rooms, and the smaller Pri-vate Lodge of 4 rooms All the rooms have their own private & roomy verandas spread within the rocks and all have been sited with spectacular views. Each lodge has its own private bar and dining area, with adjoining library / map room and its own natural rock swimming pool . All rooms have 24hr power and en-suite bathrooms with hot & cold running water, flush toilets and power-ful showers. When one of the largest animal migrations in the world crosses your door step for several months of the year, as it does at Lamai Serengeti between July and October, it's sometimes easy to overlook what all of us who have spent so long in the Serengeti keep reminding ourselves. It's not all about the migration. To define the Serengeti purely in terms of the wildebeest timetable is to massively underestimate the variety of this part of Africa. Throughout the year, not only can we use our 4x4 s to explore the intricasies of the area, both south of the Mara River and (river state permitting) to the north, but we're able to offer walking safaris from here. The topography lends itself well to being on your feet; small valleys, river lines and rocky kopjes make for frequent changes of scenery...and great cover for approaching wild animals unseen. This area of lush, rolling grassland and tree-lined watercourses is the hub around which the Serengeti migration circulates. During the dry season, the herds mass on both banks of the Mara River, frequently crossing - and braving the crocs - in response to local weather patterns that only they seem to understand. But even a brief visit to Lamai Serengeti at any time of year will demostrate that it's not all about the migration. Unlike the southern plains of the Serengeti that dry out, forcing all but the hardiest of species to leave, this area remains lush and green. There's a collective sigh of relief from the resident game when the one and a half million migrating wildebeest - and the madness that attends them - leave town for a few months. And the resident game at Lamai Serengeti is spectacular. Plains game in the form of zebra, topi, gazelles, impala, buffalo and giraffe all frequent the area throughout the year. Lion are rarely far away and leopard, ever present, but always elusive, stalk the rocky kopjes and river lines.